Our state will have more than 700,000 job openings by 2021, and a majority of them will require knowledge in science, technology, engineering, and math. 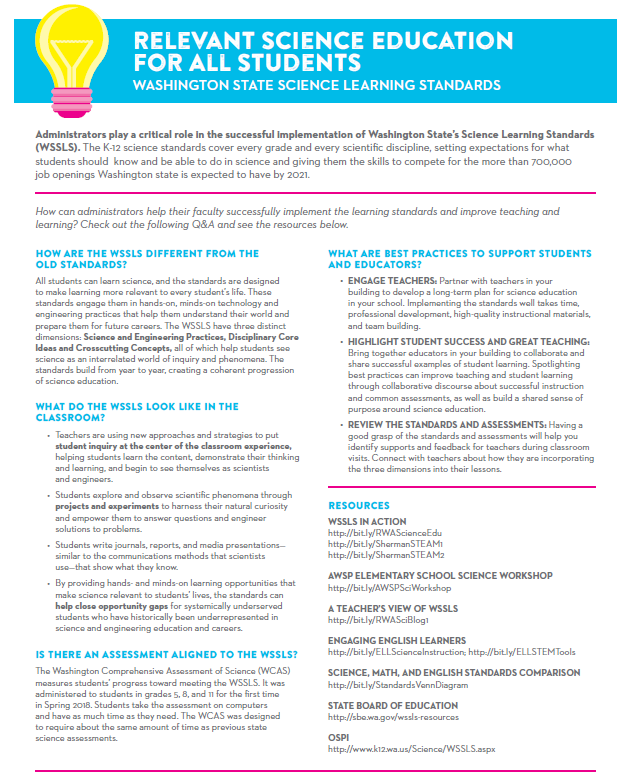 Since school administrators play a key role in ensuring quality science education experiences for students as they get ready for their futures, Ready Washington created a new fact sheet specifically for administrators with ideas and resources to support strong implementation of the Washington State Science Learning Standards. Thank you to our partners in this project, including the Washington State Board of Education, the Office of Superintendent of Public Instruction, Washington STEM, and the Association of Washington School Principals. Click the image below to download the fact sheet.